Seasonal change is soon to come, but right now, you'd never know it. Today it is so cold here in Melbourne, and from what I gather, my Northern Hemisphere friends are still sunning their faces in the warmth of the summer sun. In an effort to keep warm, this is my second sweater skirt sewing refashion. I found the stripey jumper in the sale at a local church affiliated Op Shop for $2.50 (it always makes me smile to find a sale at an Op Shop, considering the original prices are so low anyway). As with my first sweater skirt refashion sewing project, which also happened to be a turtle neck, I've snipped off each arm and body. The body becomes the skirt, and arms become legwarmers. I have over-locked (serged) all raw edges, and added a casing band to include elastic to the top of my skirt and leg warmers. For more details on how I did this, you can check out my first sweater skirt and legwarmer sewing project here. Also shared with Patti's weekly Visible Monday link up. I love this! I would love to do this, but when you start using words like serged and casing band I get a little timid. Nevertheless, I will look at your other posts for ideas I feel more confident about. Looks so cute on! Nice for cold weather, too. A great refashion! I also love your new striped legwarmers! Wonderful skirt! 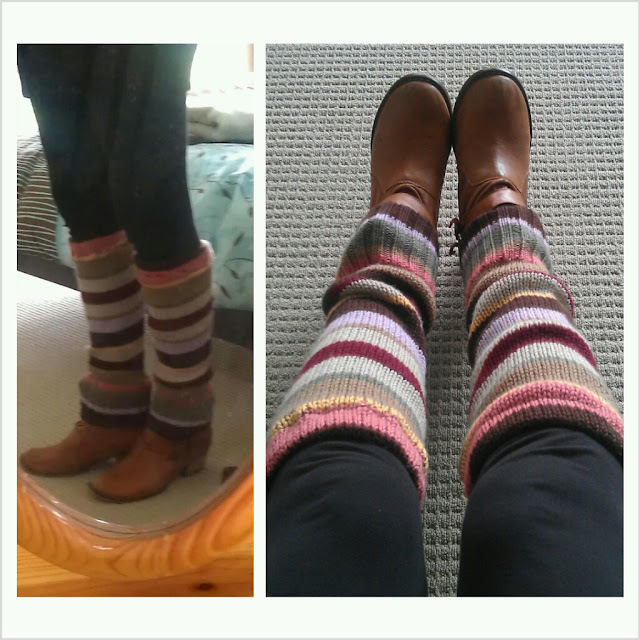 Better than the Anthro, plus you have cool leg warmers : > Thanks for sharing with Visible Monday! It's a great idea to change the sweater in a skirt! I love the colors and the stripes! Now that is pretty dang creative! I love blogs like yours that are daring, creative and passionate. Cool. I am #51 over at Visible Monday this week. Do drop in. What a success. The skirt and outfit looks great. Such a great, inspiring post! You did a fine job and look very of the moment. Clever girl. Smart and pretty ... can't ask for more than that!